of crows chirping, alive alive alive. But that’s temporary too. In my last post, I wrote about the sense of happiness I had felt when I learned that two Muslim women, Lila Fahlman and Hilwie Johma Hamdon, were to have schools named after them in Edmonton, Canada. Two Muslim women were finally being presented as important parts of Canadian history: Hamdon as an essential figure in establishing the first mosque in Canada and Fahlman for having been the first female Muslim chaplain. They were to have their names engraved in concrete. They were to be made visible and made to matter. It was a relief to read positive news amidst the constant news cycle of discrimination against Muslims. Since writing it the post I have thought more about the nuances of representation of people of colour within the Western world. Eren Cervantes-Altamirano has pointed out the need for a conversation around indigenous invisibility when talking about Arab Muslim visibility within Canada. As Eren points out succinctly and effectively, “unless you are Indigenous from Turtle Island or the descendant of the black peoples brought here through the slave trade, as people of colour and as Muslims we are settlers.” Fahlman and Hamdon, as immigrants, were settlers. Immigrants are not exempt from critiques of settler colonialism, even when they themselves suffer from their own status as foreigners. It is no secret that Western foreign policy measures have left a trail of instability throughout the globe. At the same time, generations of people across continents found solace in the ideology of the American Dream. Immigrants are not at fault for wanting to become settlers. However, within these narratives, the indigenous resistance is all too often forgotten. 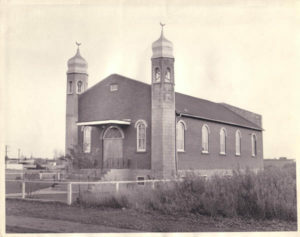 Canada’s first mosque, on Treaty 6 territory. [Source]. To begin with, the history behind the first mosque in the state of Canada is a troubled one. Eren writes that “Canada’s first mosque lays on Treaty 6 nations’ territory, an area where Indigenous peoples where starved to death and where buffalo were hunted to almost the point of extermination by European settlers.” The site of the mosque can be seen to represent the tension between the fight for indigenous sovereignty and immigrant complacence in settler colonialism. We cannot have a conversation about inclusion and recognition without acknowledging the fact that in Canada, opening a mosque isn’t just about opening a mosque. It’s about opening a mosque on indigenous land. For immigrants, there can be pressure to choose to deny the origins of land in order to be accepted. If immigrants carve out spaces for themselves (especially light-skinned Arab Muslim immigrants) without interacting and respecting the indigenous lands on which these spaces rest, this adds to the vicious cycle of indigenous erasure. Competition may arise between immigrant and indigenous groups as both can become scapegoats for economic problems of the state while also experiencing similar discrimination within the public sphere. Rather than fighting against one another, solidarity should be emphasized as necessary. Within a Qur’anic context, Muslims have a duty within this life to stand alongside the oppressed in the struggle for justice. It can be too easy to ignore the harsh history of how the Canadian state came to be, but if there is no solidarity between indigenous communities and other oppressed groups such as those of immigrants, there can be no progress. Oppressions are interlinked. My personal oppressions that I face as an Arab Muslim immigrant settler differ from those of an Indigenous Muslim, or a Black Muslim living in the West. I can’t help but wonder if these schools have still been happily named after Muslim women if those Muslim women identified as Black or indigenous. Hilwie Johma Hamdon and Lila Fahlman were two able-bodied light-skinned Arab Women whose images pose less of a threat to the Canadian “mosaic.” They were two women who accomplished much for the Muslim community without challenging colonialism or imperialism. As far as Muslim women go, they were safe choices of representation. I would like to see streets and landmarks named after activists and leaders who question the violent practices of the ongoing settler colonial project and who work with indigenous communities towards a more equitable and conscious environment. The fact that these are two Muslim women who are seen as something other than “other” made me feel visible, but it is not enough to put names on schools and step back in awe. There must be an inquiry within communities on Turtle Island into whose voices are put in the national spotlight and whose are kept in the shadows and why. Maybe these schools were named as a way to make the Muslim community feel accepted without actually affecting real change in state policy. It can be confusing to realize that the Canadian government will continue to use terms like “barbaric cultural practices” to signify a Muslim otherness while honouring Muslim female pioneers. Or will continue to put visibly Muslim women and men through humiliating and unnecessary searches that have had little to no effectiveness. Or will continue the racist practice of the no-fly list of which even children are not immune. Or will fail to stop Bill C-51 which disproportionately targets Muslim communities and forces them to give up their civil liberties without any need for evidence. Or will continue to ignore organizations such as Black Lives Matter and Idle No More who fight against police brutality and indigenous erasure. Representation cannot end with the naming of buildings after historical figures. It needs to end with true equity, visibility and accountability. I wish I could say that it is enough to simply be happy when two Muslim women are recognized within Canada. However, with regard to social justice, I believe that there is a certain level of optimism that has a tendency to eclipse oppressions. There has to be an acknowledgement that my representation could very well translate to someone else’s misrepresentation, or invisibility. It can be so nice to look on the bright side. But we have to push harder sometimes and admit we can do better.